Is Asus' shiny ET2321 the best-looking all-in-one PC ever? 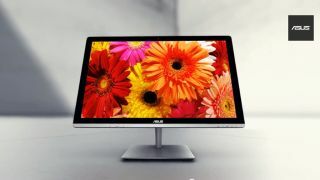 With its new ET231, Asus is aiming to bring a dash of style to the all-in-one (AIO) PC market. The slim Windows 8 machine features a 23-inch 1920 x 1080 pixel-resolution LED IPS display with a 178-degree viewing angle and optional 10-point multi-touch. Beneath the Asus ET2321's metallic stand lies a fourth generation Intel Haswell CPU and Iris graphics that provide "all-round performance", according to Asus. It also gets SonicMaster audio technology with built-in speakers. It can be fitted with a dedicated Nvidia GeForce GT 740M GPU for more powerful discrete graphics and houses up to 16GB RAM. Storage options come in various configurations, including a 2TB HDD, 128GB SSD, or a hybrid 1TB HDD and 128GB SSD configuration. On the connectivity side there are three USB 3.0 ports, three USB 2.0 ports, HDMI-in, HDMI-out, 802.11n or 802.11ac WIFI and Bluetooth 4.0. The ET231 will be available in the UK from November, but there's no word yet on pricing, nor availability in other countries. Want to take a closer peek at its curves? Then check out the video below.